You have been referred to our office by your dentist for diagnosis and, if needed, endodontic treatment. Your wellness is our primary concern. We realize that visiting a new and unfamiliar office may be accompanied by some apprehension or anxiety. We hope that these commonly asked questions, and the answers to them, will help to ease your concerns and increase your comfort. Should I extract my tooth and replace it with an implant or bridge? My dentist said I need a root canal; will Dr. Buurma make sure I need one first? 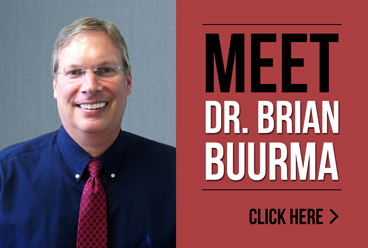 Dr. Buurma will always diagnose the problem before recommending any type of treatment. In arriving at a clinical diagnosis, he will incorporate historical (symptoms that you report), clinical testing and radiographic data. None of these, taken alone, is generally sufficient for supporting a diagnosis. Taken together, a diagnosis can usually be made. If you opt for treatment, Dr. Buurma will also review the prognosis for the tooth with you ahead of time. For example, if the tooth appears to require root canal therapy but also exhibits a large fracture extending into the root of the tooth, extraction may be a better option. Dr. Buurma will always make sure you understand all of your treatment options, with their respective prognoses (chance for success), prior to any actual treatment. The term ‘root canal’ refers to the procedure of root canal therapy, during which the contents of the dental pulp, including disease-causing bacteria, are thoroughly removed from the inside of a tooth. Once cleaned and shaped, the root canal system is then filled three-dimensionally with gutta percha, a cousin of latex rubber. In principle, it is a simple process. In practice, it can be complex, depending upon the number and shape of canals, obstructions, the overall condition of the tooth and existing dental restorations. Although from the outside, a tooth looks like a hard, solid substance, it is actually a complicated system of specialized tissues. In short, because bacteria have infected the dental pulp. The pulp contains a blood supply, nerves and the specialized tissue that formed the tooth when you were very young. Many teeth are restored without ever involving the pulp, meaning that bacteria were never allowed into the root canal system. 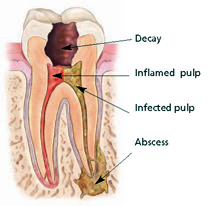 The most common way for bacteria to infect the pulp is through tooth decay and/or fracture. Upon sufficient bacterial insult, the pulp dies. After a tooth has been dead for some time, bone loss around the ends of the roots begins to appear on x-rays; however, a ‘toothache’ tooth often appears normal on an x-ray. If left untreated, an infected tooth will result in an acute dental abscess, which involves significant pain, swelling and bone destruction. Once it is clear that a tooth is in need of root canal therapy, extraction of the tooth is the only other option. Even with severely abscessed teeth, endodontic treatment often has a 95% chance of complete healing. What occurs during the endodontic treatment? Dr. Buurma examines and x-rays the tooth, then administers local anesthetic. After the tooth is numb, he places a small protective sheet called a ‘dental dam’ over the area to isolate the tooth and keep it clean and free of saliva during the procedure. He makes a small opening in the crown of the tooth and very small instruments are used to clean the pulp from the pulp chamber and root canals and to shape the space for filling. An x-ray or two may be used to check progress. After the canals have been cleaned, shaped, disinfected and dried, he then fills the root canals with a biocompatible material, usually a rubber-like material called gutta-percha. 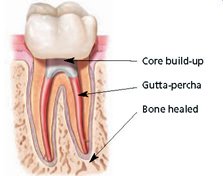 The gutta-percha is placed with an adhesive cement to ensure a complete sealing of the root canals. In most cases, a temporary filling is placed to seal the opening in the tooth. Your dentist will remove this temporary filling before the tooth is restored. Within a few weeks after your treatment with Dr. Buurma, you must return to your dentist to have a crown or other restoration placed on the tooth to protect and restore it to full function. Should I just extract the tooth and replace it with a dental implant or fixed bridge instead? Only if the prognosis for the root canal is unfavorable. A good example of this would be in the case of a fracture that runs down the root of a tooth, or if the tooth cannot be restored. After the decay has been removed, there must be sufficient tooth structure for your dentist to be able to place a full coverage crown. If there is not, then extraction becomes the better option. Whenever an endodontic procedure is estimated to carry a favorable prognosis, whether it is a root canal, retreatment or surgery, then endodontic treatment is the favored solution. It saves the tooth, is generally far less invasive, and is usually nonsurgical. Not only is it the less expensive option, but the result most closely resembles a natural, normal and healthy tooth. With root canal therapy, the periodontal ligament is retained in its healthy, normal state. The periodontal ligament is an amazing tissue, which anchors the tooth in surrounding bone and allows the tooth to move and shift, adapting to an ever-changing bite over the years. This ligament is also the highly specialized tissue that allows for orthodontic tooth movement. With a dental implant, this phenomenal tissue is lost along with the tooth, and studies suggest that an implant will require more follow-up and maintenance down the road. Most patients state that the experience of having a root canal done with Dr. Buurma is similar to having a filling done by their dentist. For Dr. Buurma, your comfort is paramount. The key to your comfort is profound local anesthesia (i.e. numbness). Dr. Buurma has undergone advanced training in the administration of local anesthesia; and topical anesthetic will be generously applied before any local anesthetic is given. If you remain extremely anxious, and you are without any medical contraindications, nitrous oxide sedation (laughing gas) is available and may help to calm your nerves. A typical appointment at our office includes an initial evaluation of the tooth or teeth in question. Dr. Buurma will ask you about the symptoms you have experienced, and he will perform some diagnostic tests and examine the area in question. If indicated by the diagnosis, the treatment typically commences. A root canal appointment typically lasts about an hour, but keep in mind that it may take 10 minutes or so to fill out initial paperwork. Overall, you should set aside nearly 1.5 hours for the visit. Occasionally, treatment may take somewhat longer, or it may become necessary to schedule a second appointment to finish. Usually one. In order to obtain the best possible prognosis for a tooth, the canal system must be absolutely clean and dry prior to obturation (filling), which may not always be achievable in a single appointment, especially if the tooth has abscessed. In other cases, the canals may be ‘calcified’ (occluded with mineralized hard tissue), which may also necessitate a second visit in order to properly finish. Other complications may make subsequent visits necessary as well. Typically, there is significant soreness for a few days after any endodontic procedure, with tenderness to pressure being most frequently reported. This is due to inflammation in the bone and tissues around the root of the tooth. Even though the treatment removed its cause, the inflammation in adjacent tissues still needs time to resolve. This can take from two days (more common) to two weeks (rare cases). Generally, the longer a tooth has been inflamed, the longer it will take to resolve after treatment. If you are already taking an antibiotic, you should continue to take that prescription until it is gone. Dr. Buurma may prescribe an antibiotic at some point during treatment. In most cases, an over-the-counter anti-inflammatory medication, such as ibuprofen, aspirin or acetaminophen will help to resolve things more quickly. If you avoid biting or chewing hard foods with the treated tooth, the post-operative inflammation will resolve more quickly. It is usually OK to brush, floss, eat and drink normally, unless Dr. Buurma gives you specific instructions that differ. If you wear a bite splint, it is usually OK, and often beneficial, to continue using it. In a few cases, where the tooth already exhibits a coronal fracture, it may be recommended to try to avoid chewing on that side of your mouth until your dentist has placed the crown. Not only will the crown help to prevent further fracture of the tooth, but it will also provide a critical seal to prevent oral bacteria from re-infecting the tooth. The critical importance of returning to your dentist, for restoration as well as regular dental care and maintenance, cannot be over-stated. Many dentists will perform root canal therapy on uncomplicated teeth. Many teeth are more complicated to treat; but also, the principles and practices of root canal therapy are very different from those of other types of dental care. Because of this, your dentist may refer you to an Endodontist. Endodontists have advanced training and expertise in treating all sorts of complications involving the roots of teeth. These complications include calcified (i.e. occluded with hard tissue) canals, multiple canals, complex root canal anatomy (curves, pulp stones, etc. ), root resorptions of various types, trauma, etc. Endodontists can perform root canal therapy through crowns or bridges, often preventing the need for a new restoration, which translates to significant cost savings for the patient. In general, your root canal will be easier for you, take less of your time, and even carry a higher long-term prognosis, if performed by a specialist.